One of the most promising advantages of shrinking the human species would be the abundance of food. A single chicken could feed up to 100 people. But perhaps it’s not just a matter of abundance. We might encounter some unsuspected differences in the way we relate to food. To understand our future relationship with a common ingredient like poultry, Arne Hendriks and artist/chef Harold de Bree will host an investigative dinner and roast an entire ostrich as if it were a chicken. A chicken carcas in the supermarket weighs around 1,2 kilograms. 2/3rds of that (800 grams) is consumable meat. That leaves about 8 grams of meat per person. 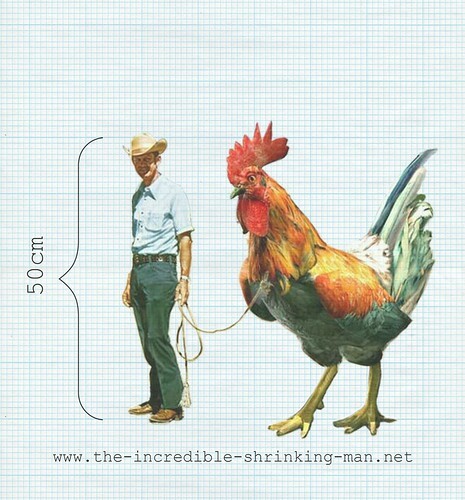 For The Incredible Shrinking Man (length 50 cm & weight 1,7 kg) that would be a good portion. The carcas of a 13 month old ostrich weighs around 45 kg and contains well over 30 kg of actual meat. That translates into 300 grams of meat for each of the 100 guests.